Figure 10.10. Aminoglycosides. A: Kanamycin. B: Neomycin. C: Gentamycin. neomycin type aminoglycosides (Noller et al., 1990; Pirohit & Stern, 1994). 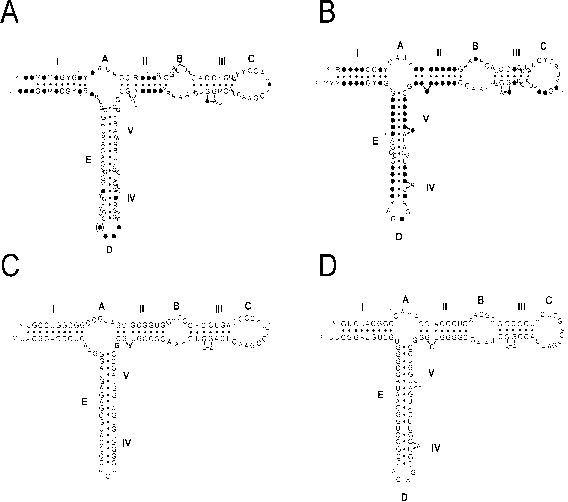 Direct contacts of a neomycin-type antibiotic with positions 1492-1494 have been determined also in structural studies of the complex of the antibiotic with the 27-nucleotide-long model of the decoding region of the 16S rRNA (Fourmy et al., 1996). Neomycin protects also C525 in the end loop of the last hairpin of domain I which is known to be in the close vicinity to the A site as well (see Fig. 9.3). 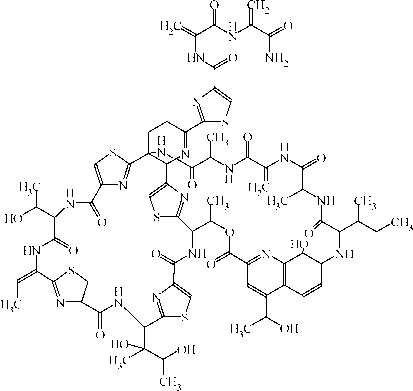 Streptomycin has been found to protect positions 911-915 at the interdomain hairpin (see Fig. 6.1), very close to the decoding center mentioned above and to the tetracycline-protected site. Mutations of the ribosomal RNA at the same regions (positions 1409 and 1491 in the case of neomycin-type antibiotics, and 523 and 912 in the case of streptomycin; see Cundliffe, 1990) confer the resistance against the aminoglycosides. It is interesting that the mutations of ribosomal proteins which affect the streptomycin sensitivity of the ribosome alter the protection pattern of ribosomal RNA also in the same regions. Thus, the aminoglycosides have an affinity to some structural elements of the ribosomal RNA in the small subunit adjacently to the A site, and their binding affects the selectivity of the A site, either directly or, more likely, via distortion of the local RNA structure. The ribosomal proteins of S4-S5-S12-S17 group are involved in properly maintaining this local structure, and their mutations may be either antagonistic, or synergistic with the aminoglycoside action. There are several known inhibitors that suppress primarily the EF-Tu- or eEF1A-promoted binding of the aminoacyl-tRNA to the ribosome by blocking the factor-binding site of the 50S or 60S ribosomal subunit. Antibiotics thiostrepton (Fig. 10.11) and related siomycin provide typical examples of such action. Large molecules of these antibiotics bind tightly to the 50S subunit in the region of the L7/L12 stalk base and prevent EF-Tu, as well as EF-G, from interacting with the factor-binding site. Protein L11 has been shown to be involved in the thiostrepton binding. Ribosomes lacking protein L11 are shown to be functionally active and insensitive to the antibiotic. It is remarkable that in certain mutants resistant to the antibiotic protein L11 is completely absent (rather than being simply altered). At the same time the site of thiostrepton binding has been identified as the factor-binding hairpin in domain II of the 23S ribosomal RNA (residues 1050-1100, Fig. 6.6 A; see Section 9.4) where protein S11 is also bound (see Section 8.3.2), rather than protein L11 itself (Cundliffe, 1990). It seems that protein L11 maintains a specific local conformation of the RNA required for thiostrepton binding. Protein inhibitors (toxins) of plant and fungal origin, such as ricin, abrin, modeccin, and a-sarcin, inactivate the other factor-binding region of the ribosomal RNA of the large subunit, the so-called ricin/ sarcin loop in domain VI (positions equivalent to 2653-2667 in E. coli 23S RNA, Fig. 6.6 A). They act specifically on the eukaryotic ribosomes. The inactivation of the factor-binding loop results from a very specific enzymatic attack of the protein on this local structural element of RNA. The plant toxins (ricin, abrin, modeccin) are N-glycosidases and catalyze depurinization of the nucleotide residue in the middle of the loop (A4324 of the mammalian 28S RNA, equivalent to A2660 of the E. coli 23S RNA), whereas sarcin is endonuclease and splits the polynucleotide chain after the adjacent residue (between the resudues equivalent to G2661 and A2662 in E. coli RNA) (see Sections 13.5.3 and 13.5.4, and Fig. 13.6). As a result, the binding of the ternary complex Aa-tRNA:eEF1A:GTP to the ribosome is impaired. The same is true for eEF2:GTP binding, and therefore the translocation step is also inhibited. Fusidic acid (see Fig. 12.4) generally is considered to be a translocation inhibitor but in essence is an inhibitor of aminoacyl-tRNA binding. The antibiotic does not affect the ribosome but binds to EF-G. As a result, the protein acquires an increased affinity to the factor-binding site of the 50S ribosomal subunit and remains complexed with the site after translocation and GTP hydrolysis. The complex between EF-G:GDP and fusidic acid thus inhibits the interaction of EF-Tu and the aminoacyl end of tRNA with the 50S ribosomal subunit. Finally, it is worthwhile to consider kirromycin as an antibiotic affecting EF-Tu; kirromycin (Fig. 10.12) does not inhibit the binding of aminoacyl-tRNA but rather blocks the subsequent stage of the cycle. It affects EF-Tu just as fusidic acid affects EF-G: EF-Tu acquires a high affinity to both the ribosome and the aminoacyl-tRNA, with the result that the factor protein is not released after GTP hydrolysis and blocks the aminoacyl terminus from participating in transpeptidation. It should be emphasized that the interaction of kirromycin with EF-Tu induces the intrinsic GTPase activity of the protein in the absence of the ribosome. These observations provided the basis for concluding that the GTPase center is present on the EF-Tu itself rather than on the ribosome, and thus the ribosome just activates the latent GTPase of EF-Tu. Miscoding resulting from the incorrect binding of aminoacyl-tRNA to the ribosome in the presence of streptomycin and other aminoglycoside antibiotics is not a qualitatively new aspect in the function of translation machinery. A certain low level of erroneous aminoacyl-tRNA binding to the ribosome is always present in translation, and the aminoglycoside antibiotics only increase the magnitude. A particular template codon located in the ribosomal A site may erroneously bind only a limited set of other (noncognate) aminoacyl-tRNAs of related coding specificity. Aminoglycoside antibiotics stimulate, as a rule, the binding of the same set of noncognate aminoacyl-tRNAs without contributing new ambiguities. In the simplest cell-free system of poly(U)-directed polyphenylalanine synthesis with E. coli ribosomes, one can detect a marked misincorporation of leucine and isoleucine, as well as of serine, tyrosine, and valine in decreasing levels. The incorporation of these five amino acids, in particular of leucine and isoleucine, is greatly stimulated by streptomycin. Figure 10.13 shows the correct codon-anticodon pairing of the template with tRNAPhe and the known incorrect types of UUU codon pairing with anticodons of E. coli tRNAIle, tRNALeu, tRNASer, tRNATyr, and tRNAVal . It can be thought that two of the three nucleotide positions in the codon-anticodon complex should be paired (including noncanonical pairing at the wobble position) in order to provide perceptable binding of noncognate tRNA in the A site of the ribosome.